Out of all the former Beatles, Paul McCartney by far had the most successful solo career, maintaining a constant presence in the British and American charts during the ’70s and ’80s. In America alone, he had nine number one singles and seven number one albums during the first 12 years of his solo career. Although he sold records, McCartney never attained much critical respect, especially when compared to his former partner John Lennon. Then again, he pursued a different path than Lennon, deciding early on that he wanted to be in a rock band. Little more than a year after The Beatles‘ breakup, McCartney had formed Wings with his wife, Linda, and the group remained active for the next ten years, racking up a string of hit albums, singles, and tours in the meantime. By the late ’70s, many critics were taking potshots at McCartney’s effortlessly melodic songcraft, but that didn’t stop the public from buying his records. His sales didn’t slow considerably until the late ’80s, and he retaliated with his first full-scale tour since the ’70s, which was a considerable success. During the ’90s, McCartney recorded less frequently, concentrating on projects like his first classical recording, a techno album, and the Beatles’ Anthology. Like Lennon and George Harrison, Paul McCartney began exploring creative avenues outside The Beatles during the late ’60s, but where his bandmates released their own experimental records, McCartney confined himself to writing and production for other artists, with the exception of his 1966 soundtrack to The Family Way. Following his marriage to Linda Eastman on March 12, 1969, McCartney began working at his home studio on his first solo album. He released the record, McCartney, in April 1970, two weeks before the Beatles’ Let It Be was scheduled to hit the stores. Prior to the album’s release, he announced that The Beatles were breaking up, which was against the wishes of the other members. As a result, the tensions between him and the other three members, particularly Harrison and Lennon, increased and he earned the ill will of many critics. Nevertheless, McCartney became a hit, spending three weeks at the top of the American charts. Early in 1971, he returned with “Another Day,” which became his first hit single as a solo artist. It was followed several months later by Ram, another homemade collection, this time featuring the contributions of his wife, Linda. By the end of 1971, the McCartneys had formed Wings, which was intended to be a full-fledged recording and touring band. Former Moody Blues guitarist Denny Laine and drummer Denny Seiwell became the group’s other members, and Wings released their first album, Wild Life, in December 1971. Wild Life was greeted with poor reviews and was a relative flop. McCartney and Wings, which now featured former Grease Band guitarist Henry McCullough, spent 1972 as a working band, releasing three singles — the protest “Give Ireland Back to the Irish,” the reggae-fied “Mary Had a Little Lamb,” and the rocking “Hi Hi Hi.” Red Rose Speedway followed in the spring of 1973, and while it received weak reviews, it became his second American number one album. Later in 1973, Wings embarked on their first British tour, at the conclusion of which McCullough and Seiwell left the band. Prior to their departure, McCartney’s theme to the James Bond movie Live and Let Die became a Top Ten hit in the U.S. and U.K. That summer, the remaining Wings proceeded to record a new album in Nigeria. Released late in 1973, Band on the Run was simultaneously McCartney’s best-reviewed album and his most successful, spending four weeks at the top of the U.S. charts and eventually going triple platinum. Following the success of Band on the Run, McCartney formed a new version of Wings with guitarist Jimmy McCulloch and drummer Geoff Britton. The new lineup was showcased on the 1974 British single “Junior’s Farm” and the 1975 hit album Venus and Mars. At the Speed of Sound followed in 1976, and it was the first Wings record to feature songwriting contributions by the other bandmembers. Nevertheless, the album became a monster success on the basis of two McCartney songs, “Silly Love Songs” and “Let ‘Em In.” Wings supported the album with their first international tour, which broke many attendance records and was captured on the live triple album Wings Over America (1976). After the tour was completed, Wings rested a bit during 1977, as McCartney released an instrumental version of Ram under the name Thrillington and produced Denny Laine’s solo album Holly Days. Later that year, Wings released “Mull of Kintyre,” which became the biggest-selling British single of all time, selling over two million copies. Wings followed “Mull of Kintyre” with London Town in 1978, which became another platinum record. After its release, McCulloch left the band to join the re-formed Small Faces and Wings released Back to the Egg in 1979. Though the record went platinum, it failed to produce any big hits. Early in 1980, McCartney was arrested for marijuana possession at the beginning of a Japanese tour; he was imprisoned for ten days and then released, without any charges being pressed. Wings effectively broke up in the wake of McCartney’s Japanese bust, although its official dissolution was not announced until April 27, 1981, when Denny Laine left the band. Back in England, McCartney recorded McCartney II, which was a one-man band effort like his solo debut. Ironically, the hit single associated with the album was a live take of the song “Coming Up” that had been recorded in Glasgow with Wings in December 1979 and was intended to be the B-side of the 45, with the solo studio recording as the A-side. DJs preferred the live version, however, and it went on to hit number one. Later in 1980, McCartney entered the studio with Beatles producer George Martin to make Tug of War. Released in the spring of 1982, Tug of War received the best reviews of any McCartney record since Band on the Run and spawned the number one single “Ebony and Ivory,” a duet with Stevie Wonder that became McCartney’s biggest American hit. In 1983, McCartney sang on “The Girl Is Mine,” the first single from Michael Jackson‘s blockbuster album Thriller. In return, Jackson dueted with McCartney on “Say Say Say,” the first single from Paul’s 1983 album Pipes of Peace and the last number one single of his career. The relationship between Jackson and McCartney soured considerably when Jackson bought the publishing rights to The Beatles songs from underneath McCartney in 1985. McCartney directed his first feature film in 1984 with Give My Regards to Broad Street. While the soundtrack, which featured new songs and re-recorded Beatles tunes, was a hit, generating the hit single “No More Lonely Nights,” the film was a flop, earning terrible reviews. The following year he had his last American Top Ten with the theme to the Chevy Chase/Dan Aykroyd comedy Spies Like Us. Press to Play (1986) received some strong reviews but the album was a flop. In 1988, he recorded a collection of rock & roll oldies called Choba B CCCP for release in the U.S.S.R.; it was given official release in the U.S. and U.K. in 1991. For 1989′s Flowers in the Dirt, McCartney co-wrote several songs with Elvis Costello; the pair also wrote songs for Costello’s Spike, including the hit “Veronica.” Flowers in the Dirt received the strongest reviews of any McCartney release since Tug of War and was supported by an extensive international tour, which was captured on the live double album Tripping the Live Fantastic (1990). For the tour, McCartney hired guitarist Robbie McIntosh and bassist Hamish Stuart, who would form the core of his band through the remainder of the ’90s. Early in 1991, McCartney released another live album in the form of Unplugged, which was taken from his appearance on MTV’s acoustic concert program of the same name; it was the first Unplugged album to be released. Later that year, he unveiled Liverpool Oratorio, his first classical work. Another pop album, Off the Ground, followed in 1993, but the album failed to generate any big hits, despite McCartney’s successful supporting tour. Following the completion of the New World tour, he released another live album, Paul Is Live, in December 1993. In 1994, he released an ambient techno album under the pseudonym the Fireman. 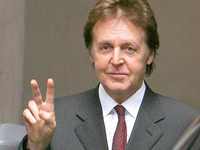 McCartney premiered his second classical piece, “The Leaf,” early in 1995 and then began hosting a Westwood One radio series called Oobu Joobu. But his primary activity in 1995, as well as 1996, was the Beatles’ Anthology, which encompassed a lengthy video documentary of the band and the multi-volume release of Beatles outtakes and rarities. After Anthology was completed, he released Flaming Pie in summer 1997. A low-key, largely acoustic affair that had the some of the same charm of his debut, Flaming Pie was given the strongest reviews McCartney had received in years and was a modest commercial success, debuting at number two on the U.S. and U.K. charts; it was his highest American chart placing since he left the Beatles. Flaming Pie certainly benefited from the success of Anthology, as did McCartney himself — only a few months before the release of the album in 1997, he received a Knightship.